I looked about on the net for how to modify my Icom IC-910H to bring the main band IF out on a connector at the rear of the radio but couldn’t find anything so I dug out my service manual and went at it myself. This modification was done so I could monitor the IF output of the IC-910H on my Flex-1500 SDR radio using the supplied PowerSDR software, what this gives is the ability to graphically watch about 50KHz of bandwidth in a waterfall to spot any acitivity. I then built my Flex-1500 interface project to allow control of the actual radio frequency based on what I was monitoring in the IF, i.e. click on the activity in the PowerSDR waterfall and it would tune the radio to that frequency. My first version wasn’t a modification, the only thing needed done was to attach some thin coax to a point on the PCB and bring it to an SMS connector on the rear panel of the radio. This simple tapping of the IF worked but I found if I went before the 10.8MHz filter and 2nd IF amp I reduced the sensitivity of the radio, I’m guessing this was for 2 reasons; the IF path being split in 2 directions and impedance miss-match. So in this version I went after the 2nd IF amp which was after the 10.8MHz filter so the bandwidth of the IF signal was only about 15KHz either side from the tuned frequency of the IC-910, i.e. if the IC-910 was on 144.300 I could only monitor from 144.285MHz to 144.315MHz with any sensitivity, the rest was being blocked by the 10.8MHz filter as you can see in the plot. 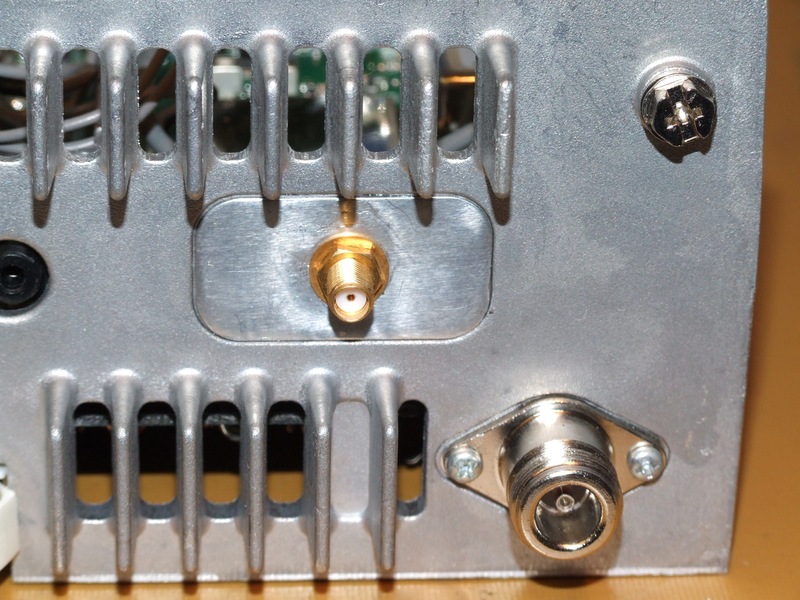 Not long after I done this mod I bought a FunCube SDR dongle and joined the Yahoo group supporting it. One member posted on there about how he modded his FT-817 to get the IF out where there was a reply about how Matt VK2DAG had modded his IC-910 to get the IF out and he used an IF buffer amp kit from Clifton Laboratories. The second version of my mod therefore would use these also and pretty much followed Matt’s document. I bought some Z10000 Buffer Amplifier kits from Clifton Laboratories which I’ve now fitted to my IC-910 which works great. You are able to set the gain on them and I set mine to plain old 0dB (499R for R7). It allowed me to move the tap point back to before the 10.85MHz filter and so I am able to monitor the whole 2m band, and beyond, from my IF tap point. I have read your your work regarding the IF output modification of the 910H rig. Nice work btw. I’m interested on connecting the Icom 910H with the SDR-IQ for LEO satellite communication, especially with university cubesats. I have a question regarding the first version of your modification. You stated that tapping the IF before the BPF (FI151, main band), the sensitivity of the 910H radio is reduced due to impedance missmatch. To what extent, the sensitivity of the Icom receiver was reduced compared with the second version of your modification (IF tapping after the filter)? Did you made some comparable experimental tests to observe the difference between the 2 solutions?? Is it that bad, using the first solution? I also would like to extract the IF from an IC-910H and I found your article after a brief search. Looking at the IC-910 schematic, there are two places where an IF transformer is used but the secondary is left unconnected. These might provide a low impedance output suitable to drive a spectrum analyser. They are L653 and L703 (in the noise blanker IF amp) Did you consider trying either of those points?